Last month, Sandra & I attended the Marketing Research Association’s Corporate Researchers Conference (CRC) in St. Louis. We were thrilled to share the stage with Stephenie Gordon of Schlesinger Associates and Jill Donahue from Nestle Purina North America–two of the most entertaining and supportive colleagues I know! Among the many highlights, I LOVED the Wells Fargo session (a study in how to do authenticity right and capitalize on historic trends), the Hallmark session (she was CHOCK full of practical, ingenuous, affordable nuggets), the Gongos session (loved that it was in Prezi and found his concept of CONSUMAN and the Chief Aggregator function in companies intriguing). The power of an individual’s mindset was ever present at TEDXDetroit. First, Rita Fields spoke about her experience surviving poverty and she advised us to, “Live with your future selves in mind.” Then, Push Goddess, Sharina Jones, shared her story of overcoming her own personal tragedy by encouraging those around her. She talked about work she’d done–essentially resulting from observational research–to help equip children with wheelchairs so they could get to school in countries where they had none. 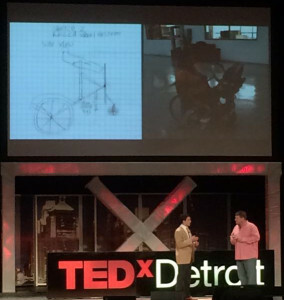 The incredible epilogue to her talk was when 11th grade student, Alden Dean, followed with his own talk about designing a wheelchair stroller for disabled parents in his high school applied STEM class. Two answers surfaced during a walk with a friend.The link between walking and creativity is not new. And, I typically walk with friends–many of whom are professionals who work in different functional roles across several disparate industries. It occurred to me that these walks often involve active discourse, something like the lab or the network Trendwatching suggests here. My walking partner shared that she’d been so encouraged by the story I told her about Wells Fargo’s public relations research that she was looking for a way to apply it in her own organization! I often feel that way at the end of these walks, equipped with something new and immediately applicable, reinforcing the TED mantra that “fresh inputs really do lead to fresh ideas.” And, it’s powerful to feel like I have the ability to make even a little positive impact on someone’s day.